It is time to plan the touristic season 2018 and become an exponent of the most popular online fairs in the Russian-speaking space. Register and learn the recent news and the most interesting facts at 9 unique online fairs of Profi.travel. For four years and at one platform, Profi.Travel online fairs have been gathering together the travel representatives - national tourist offices, tour operators, hoteliers, airlines and DMCs, offering them a chance to represent the tour product to the audience of many thousands from Russia and the CIS. There’s nothing like such events in Russia. Not a single online resource, much less a traditional fair, can make it possible to introduce your product to the travel agents with minimum expense from your own office, as well as establish contacts, enquire about trends and novelties of the year from the fellow professionals. No expenses for business trips, hotels and catalogues – instead of this: instant feedback, professionally prepared manuals and guides that summarize the fair results and also contacts collected in one place. Profi.Travel prepares nine fairs in the new season. The events calendar is formed with a glance to all peculiarities of tourism market – seasons, early booking periods and destination demands. 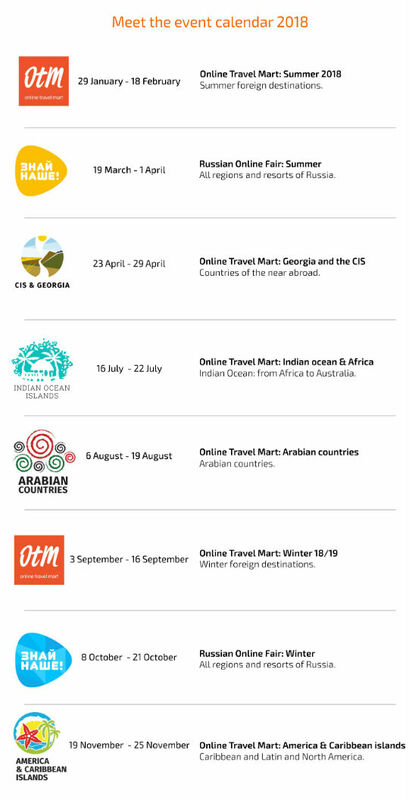 In the end of January, the fair season will be opened with ONLINE TRAVEL MART: SUMMER - the only online fair dedicated to all summer destinations, which is held for the Russian-speaking travel professionals of Russia and the CIS countries. In September, the similar OTM fair will demonstrate the winter season. Such fairs are the professional must-have, which allows travel agents to learn simply everything about the upcoming tourist season – prices, destinations and new laws. Due to this, OTMs gather together thousands of participants and give a chance to tour operators, hoteliers and airlines to represent their product and learn to sell. The market needs the major and complex fair which allows to get ready for the upcoming season. That was the reason for us to offer the new online fair format in February - OTM. It became recognisable at once, over 50 exponents and thousands of attendees evaluated the event. Winter and summer OTM both are the possibility to get ready for the upcoming season optimally, but for those who are willing to learn more about the high-demand destinations, we still will organise the niche fairs, yet by the name of OTM. The main meeting point for those, who is into domestic and inbound tourism, will be the Russian Online Fair. The only fair in Russia of such scale, dedicated to the homeland tourism, is held in spring and autumn. In addition to it, here at Profi.Travel, the traditional fairs will be waiting for the visitors to present the high-demand destinations on a Russian market: Russia and the CIS, Europe and Asia, Arabian and Caribbean countries, Latin America and USA, Africa and Australia.